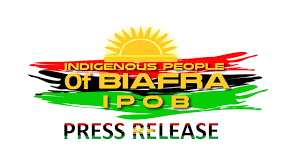 We the Indigenous People of Biafra (IPOB) wish to bring to the attention of the world that plans are at advanced stages in preparation for the first in our three-stage referendum process towards the peaceful, non-violent restoration of the nation of Biafra. Our decision to hold the first of the three plebiscite later this year has vindicated IPOB's resilience in sticking to the principles of non-violent agitation for Biafra, in the face of government brutality and treachery from enemies within. Efforts geared towards this first referendum is gathering unstoppable momentum with dates for the exercise to be announced imminently. 40 million ballot papers are being printed and readied for distribution to every clan and village in Biafraland for all adults over the age of 18 to express their preference. Through this age old democratic process, IPOB shall return power to the long suffering down trodden masses, to enable them determine their destiny which was cruelly taken away by successive Nigerian governments. This massive consultation exercise, will guide all future IPOB activities and hopefully address the issue of lack of wider participation by the people which some Nigerian government agents within have often cited as their reason for working against the emergence of Biafra. For those that set out to mislead the populace by equating IPOB call for referendum as a call for war, in order to mask their betrayal of the people, will no doubt find another reason or excuse to object to this upcoming plebiscite. It is worth reminding Ohaneze Ndigbo and their likes that on the 11th February 1961, Nigeria conducted a referendum for the people of Southern Cameroon to determine whether they wish to be part of Nigeria or merge with the Francophone northern Cameroon. This referendum resulted in the peaceful secession of the then NCNC controlled Anglophone Cameroon from Nigeria. In other words, they voted to leave Nigeria for good. That was democracy in action not war. No war was fought and no ethnic group was threatened with annihilation. If those parading themselves as leaders, with their much touted academic accomplishments, are not aware of this relatively modern history, then the pervading ignorance in Nigeria, occasioned by the spectacular collapse of the education system, is more generational than earlier thought. If those that claim to be the elite in the society cannot reference Southern Cameroons as a case where referendum resolved an intractable issue, then their supposed elitism is founded on pure fantasy. Again, on the 13th of July 1963, Nigeria conducted another referendum which led to the creation of the defunct Mid-west from the supposedly Yoruba dominated Western region. The old Mid-Western region comprised of parts of today's Delta and Edo states. No war was fought, no ethnic group was threatened with extinction. Those that canvassed for a referendum then were not labeled war mongers. It speaks of the magnitude of prevailing ignorance in Nigeria that people are in this age unaware of the fact that referendum has been used in Nigeria before to resolve a seemingly intractable issue. The mission of IPOB is to restore Biafra sovereignty via a democratic process and through the instrumentality of a three stage referendum, the first of which will be held in the coming weeks. IPOB led Biafra agitation is a struggle for liberty, justice and equity firmly anchored on fiscal independence, local control of all resources and complete autonomy for all federating ethnic nationalities. This ancient arrangement that sustained our civilisation for over 5000 years without recourse to war or conquest of one another was the arrangement Mazi Mbonu Ojike advised Dr. Nnamdi Azikiwe to adopt during the Lancaster House pre-independent negotiations. This ancient system of loose confederation, that served our ancestors very well before the British destroyed it with their amalgamation, is where IPOB is taking Biafra back to. Every ethnic nationality within Biafra will be encouraged to be independent from day one. Our fight is against a deliberate government policy of mass poverty, irreconcilable and divergent value systems, marginalisation, deprivation, incessant state sponsored murder, terrorism and unimaginable Fulani nepotism. IPOB call for referendum has nothing to do with WAR! Those beating the drums of WAR are the agents of the status quo, the Efulefus (Igbo slaves) using the cover of Ohaneze Ndigbo and PANDEF to continue running errands for their Arewa masters to the detriment and well-being of the people of the East. They, along with their feudal northern masters are the beneficiaries of this lopsided fraudulent neo-colonial system we call Nigeria. These war mongers want to scare and frighten everyone into submission. They want IPOB to accept slavery as they and their predecessors in Ohaneze have done. They want to submit this blessed IPOB generation to eternal servitude out of fear of losing the paltry favours and privileges their Arewa masters periodically grants them. Their evil antics and psychological manipulation has failed woefully. Referendum is peace not war.